All Things Dog Blog All Things Dog Blog: Dogs Dig Great Prizes! I've drawn each winner using the Random.org tool for drawing one number from a total pool of entries. I was excited to discover a reader I have yet to take note of. That's always fun! Congratulations to Roger Kethcart for commenting at the Weekly Wag on my April 26, 2013 episode of the Weekly Wag: What's Your Dog's Favorite Rub? I have a prize waiting for you and have notified you via Google+. Please reply promptly! And what about cute little Stitch! 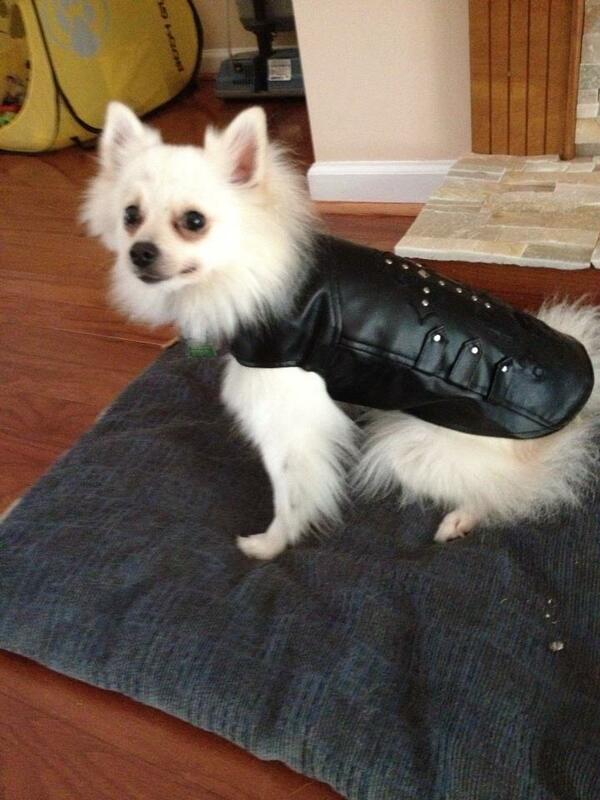 He scored a leather-look vest by PetSmart and is looking all ready for Bike Week. Stitch's photo was chosen today for our quarterly Winners' Circle drawing and he'll be receiving a package of goodies when his mom gets in touch with his address. She has been notified and we're on the lookout. Thanks to both of these readers who have participated and won fun prizes. I'm sure they'll enjoy their goodies selected from samples I have that include treats, toys and other Fido necessities. Quarterly prizes will continue through the end of 2013. Please participate and enjoy.